Powers/Abilities/Functions: Swamp City was a large community, and it varied from high-rise establishments on Boardwalk and Park Place to the slums of Baltic and Mediterranean Avenues. Under Kong Lomerate's control, the fates of the inhabitants were regularly decided by a roll of the dice, as well as random cards, which granted good or bad fortune, including sudden inheritance and lottery winnings or tickets directly to jail. 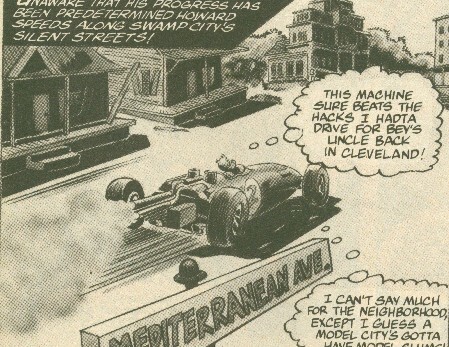 (Howard the Duck II#7 (fb)) - Swamp City was designed by architect Jock Driscoll as the city of the future, a place where all Americans could afford to live and work and raise their families. For months Driscoll and his workers labored to lay down their foundation in the heart of the Everglades, where real estate was cheap. At that task, their builder, Monk Keys, proved a genius; unfortunately at everything else he proved to be a lecher and a crook. Monk literally swept Anne Darrow Driscoll off her feet, attempting to rekindle their old affair, but her husband, Jock, punched Monk to the ground. Monk got up and left, but he threatened to take everything away from Jock. (Howard the Duck II#7 (fb) - BTS) - Keys' ruthless instincts for survival and revenge on Jock Driscoll somehow caused him to evolve into Kong Lomerate. 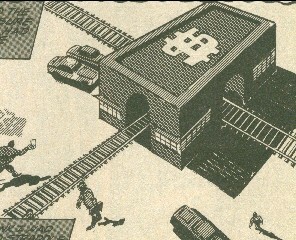 Kong manipulated his stocks, bought up Driscoll's mortgage, and undermined Driscoll's every position in the community. Via various types of pressure, Kong forced all of Swamp City's stockholders to sell out to him, and he replaced them with people loyal to him. (Howard the Duck II#7 (fb)) - Jock and his family moved into a new house in Swamp City on Tennessee Avenue, and the city also took in several urban settlers, but then Kong foreclosed Driscoll's mortgage. Driscoll confronted Kong Lomerate, who revealed how he had accomplished his takeover and then told Driscoll he was going to take his home, his livelihood, and even his family. Kong then bought up all of Swamp City: the police, the bank, the local institutions, everything. Any who refused to pay up were either forced to leave or arrested on one trumped up charge or another. To any women that entered Swamp City, Kong acted like a feudal lord, "demanding the right of the first night." (Howard the Duck II#7 (fb)) - Kong led his men to abduct Jock and Anne Driscoll, but after foreclosing their house, Kong told them to leave Amy Driscoll behind: "She is a cripple and cannot possibly hurt us!" (Howard the Duck II#7 (fb) - BTS) - Anne Driscoll was seduced by Kong's promises of material wealth (his Tower of Power), and she left Jock and became Kong's woman. (Howard the Duck II#7 (fb)) - Amy Driscoll, left all alone, cried for her parents, and her strong emotions summoned the nearby Man-Thing, who was driven to try to find her a new mommy and/or daddy. (Howard the Duck II#7) - The Man-Thing encountered Howard the Duck and Beverly Switzler; Beverly passed out and the Man-Thing, seeking a mommy for Amy Driscoll, picked her up and brought her to Swamp City. (Howard the Duck II#7) - Howard the Duck arrived in Swamp City, following the trail of the Man-Thing, who had picked up Beverly Switzler and carried her into the city. Howard received a racecar and $200 upon his arrival, and Kong Lomerate watched from a distance, affecting his progress via his dice...and via chance cards. A roll of three caused Howard's tire to blow out on Baltic Avenue; more accurately, "Deaf Melon" Washington shot out his tire. Melon then forced Howard to buy his property, after which a taxman charged him property tax on his new purchase. After narrowly evading an onrushing train and the rolling giant dice (three again) with the help of the people from Oriental Avenue. 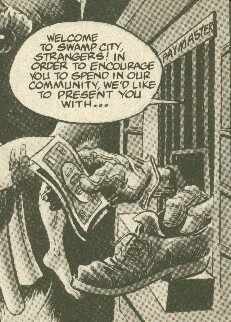 Howard then ran onto a representative of the Swamp City's Lottery Authority, who offered him a Chance card, which sent Howard directly to jail; a cop picked him up for vagrancy. 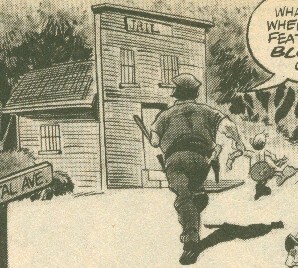 In prison, Howard met Jock Driscoll and several other former home-owners, who told him of Swamp City's origins and Kong Lomerate's takeover and tyranny. Howard faked a suicide, and then he and the other prisoners ambushed the guard who came to check on them, allowing them to escape. 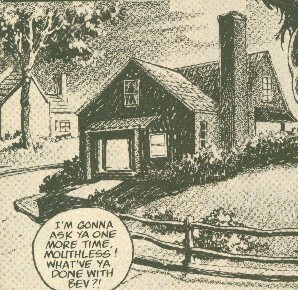 Howard located and continued to follow the Man-Thing to the former Driscoll house, where he found Beverly awake and unharmed, and he learned of the Man-Thing's connection to Amy Driscoll. Some of the City's administrators then arrived, but the Man-Thing fought them off. Howard and Beverly used the distraction to take Amy and flee, dodging the dice once again. They stole a van from a free parking lot on Kentucky Avenue, and they then met up with Jock, who had hijacked the B & O Railroad. Jock brought them to the bank, into which he crashed, releasing all of the money hoarded by Kong back to its original owners. Howard, Beverly, Jock, and Amy took the Shortline Railroad to Kong's stronghold, Empire Hotel on Boardwalk. Luckily gaining a pass to Boardwalk by a Chance man, and they confronted Kong, who prepared to eliminate them. However, the Man-Thing then arrived, and Kong grabbed Amy--in an unsuccessful effort to try to force her to send the Man-Thing away--and then he climbed to the top of his Tower of Power to escape the Man-Thing. The swamp creature followed him, and Howard climbed up the other side in an effort to rescue Amy before the Tower collapsed under Kong and the Man-Thing's weight. Kong screamed as the Man-Thing reached for him, and he soon burst into flames and leapt off the Tower. Kong crashed to the ground, and Howard and Amy used him as a cushion/springboard as they fell from the Tower, which then collapsed on top of Kong, apparently killing him. 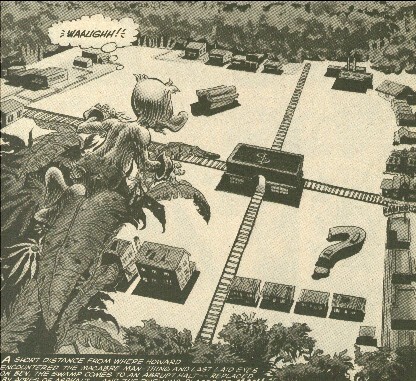 With Kong out of power, Jock Driscoll planned to return Swamp City to the pleasant community he had originally intended. Jock gave Howard and Beverly some cash to get them started, and the two left to continue their trek across America. Comments: Created by Bill Mantlo and Gene Colan. Swamp City was obviously a play on the Parker Brothers' game, Monopoly (Parker Brothers being now owned by Hasbro). It's most likely that all of the Monopoly properties, institutions, etc. were represented, but I'm only mentioning those that were confirmed. I do recall off the top of my head that the two other railroads were the Pennsylvania and the Reading. IF Swamp City existed, it would be just a few miles from my home. I'm just East of the Everglades. 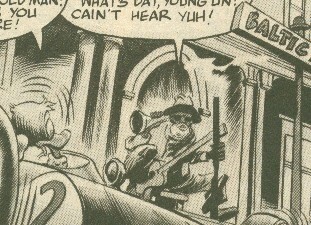 One of the four railways, all of which passed through the Bank, it was hijacked by Jock, who picked up Beverly, Howard, and Amy, and then crashed it into the bank, releasing the money Kong had taken from the residents. Straddling Swamp City's four railroad lines, it was taken over and run by Kong Lomerate and his stockholders. 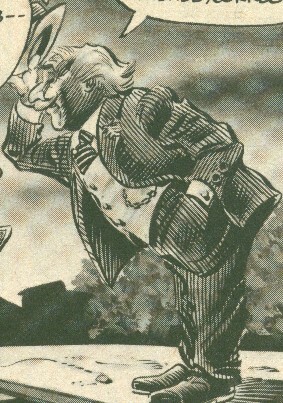 Jock Driscoll eventually crashed the train from the B & O railroad into it, releasing the money Kong Lomerate had cheated out of the other residents. The most expensive property in Swamp City, it was owned by Kong Lomerate who built the Empire Hotel on top of it. Its residents moved to Swamp City months earlier, lured by the low rents promised in the brochure, but after Kong Lomerate took over, their mortgages were foreclosed (which also happened on Vermont and Oriental Avenues). The Swamp City bank told the residents to leave or be jailed for trespassing. 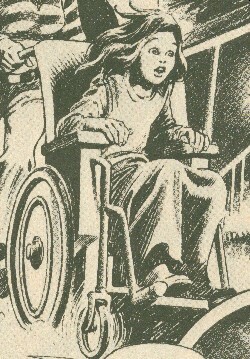 Confined to a wheelchair, Amy loved her new house, but she was left behind when Kong Lomerate and his men abducted her parents. As she cried for her parents, her distress drew the attention of the Man-Thing, who then attempted to fill her need by seeking out a mommy or daddy for her. When the Man-Thing brought back Beverly Switzler, Amy accepted her as a surrogate parent, and she then accompanied Howard & Beverly to confront Kong. 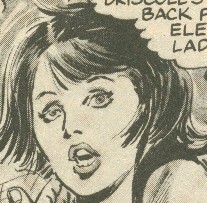 She was taken hostage by Kong to try to keep the Man-Thing away from him, but she was rescued by Howard from Kong's Tower of Power before it collapsed. She was happily reunited with her parents. A former cheerleader, Anne dated football player Monk Keys in high school before going on to marry Jock Driscoll. After Monk turned into Kong Lomerate, he seduced her with wealth and material possessions. She became Kong's lover, and she didn't even remember Jock or Amy when she saw them. However, when Amy was endangered by Kong, Jock was able to slap some sense into her, and she came back to her right mind. The architect for Swamp City, he punched out his builder, Monk Keys, when he tried to rekindle his old romance with Anne. Keys went on to become Kong Lomerate and took everything from him. Jock lost his city, his own property (on Tennessee Avenue), and his family, and he was thrown in prison. Escaping with the aid of Howard, he commandeered the B & O Railroad's train and crashed it into the bank, releasing the money that Kong had taken from the other residents. 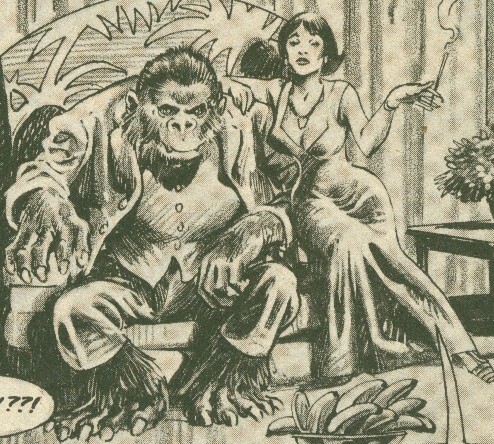 Jock led Howard, Beverly, and Amy to confront Kong; after Kong's apparent death, he was reunited with Anne and planned to rebuild Swamp City. despite his prominence in the story, good pictures of Jock were in short supply. It overlooked the Driscoll house on Tennessee Avenue. 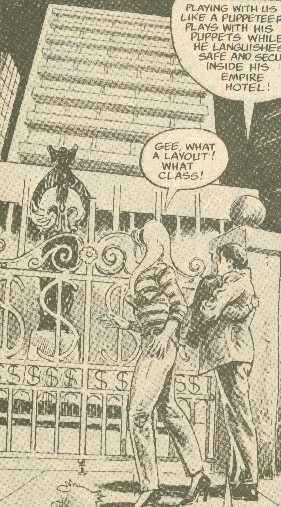 It was a deluxe hotel built by Kong on Boardwalk, and the penthouse served as his home. On Kentucky Avenue, it allowed parking at no charge. 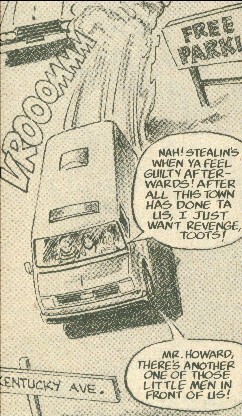 Howard stole a van from the lot to take Beverly and Amy to confront Kong Lomerate. At the entrance to Swamp City, the Paymaster gave new arrivals $200 and a gift (such as a shoe or even a car) to get them started and to encourage spending in their community. The Man-Thing ignored both the $200 and the shoe he was offered, but Howard happily took the $200 and the car. A standard small-town prison, though Kong manipulated events so that anyone crossing him was sent there, often via his Chance cards. Howard was arrested for vagrancy after receiving such a card, and Jock Driscoll and many other former property owners were sent here. Howard faked his death to get a guard to enter the cell, then ambushed him, allowing the other prisoners to escape. Other than being the site of the Free Parking Lot, not much else was said about this place. It was a slum area, much like Baltic Avenue. Its residents moved to Swamp City months earlier, lured by the low rents promised in the brochure, but after Kong Lomerate took over, their mortgages were foreclosed (which also happened on Vermont and Connecticut Avenues). The Swamp City bank told the residents to leave or be jailed for trespassing. Despite their other concerns, one of the residents, an elderly gentleman, was most interested in Howard, whom he thought would go well with almonds. A wealthy area just next to Boardwalk. There were a number of identically dressed and appearing men who would show up suddenly, dispensing cards of chance or from the community chest, granting money, charging taxes, and sending people to jail. They tried futilely to subdue the Man-Thing, who ignored them. They were all agents of Kong Lomerate, and I'm not sure whether they were actually the same people as his stockholders or not. One of the four railways, all of which passed through the Bank, it was used by Jock to take Howard, Beverly, and Amy from the bank to approach the Boardwalk. It is pictured within the bank in the main profile. A suburb, it contained the Driscoll's house. Its residents moved to Swamp City months earlier, lured by the low rents promised in the brochure, but after Kong Lomerate took over, their mortgages were foreclosed (which also happened on Oriental and Connecticut Avenues). The Swamp City bank told the residents to leave or be jailed for trespassing. 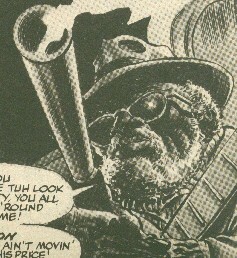 He used to be the most famous Blues critic in the world before he lost his hearing. Moving to Swamp City, he bought a house on Baltic Avenue for $60. Sometime later, Kong Lomerate's people tried to drive him out, because his kind lowered the property values ("his kind" meaning deaf people). Washington refused to sell, and he held onto his lease, charging $4 to anyone who stopped there. "Deaf Melon" shot out Howard's car's front tire as he passed by, then offered him a choice between $4 per night rent or buying the property for $100 plus Howard's car. "Deaf Melon" grabbed the car and took off, pointing Howard in Beverly's direction as he left. He was equipped with one of those cones people with poor hearing used to use, as well as a shotgun.